Say what you will about the Ted-Robin relationship, but man, does Josh Radnor sell the hell out of that speech. So much of the show has been about love, about relationships, about Ted-Robin, and this is a huge, pivotal moment for the character. It’s a bit disappointing to me that the writers dragged it all out until the penultimate episode of the series, but I’m happy the guy gets closure nonetheless. It’s a moment that even he acknowledges is cheesy, and it’s all about truly supporting Robin and doing what’s best for both of them; although the sudden outpouring of feelings is a bit contrived–even for a wedding scenario–it still results in some nice, emotionally affecting scenes. One such is example is Robin’s run-in with the Mother. Honestly, at this point, I thought the Mother would’ve played a bigger role. After “How Your Mother Met Me”, I was really looking forward to continued exploration of the character, and not just her in relation to Ted; rather, her as her own, unique person. Cristin Miloti has proved countless times that she could handle that kind of stuff. I’m guessing we won’t get much of that considering there’s only an hour left–and if they go the “Mother is dead” route, I will be so angry–but man, her scene with Robin tonight is really fantastic. The writers acknowledge that she doesn’t know Robin, instead electing to have her give some simple advice, something that’s worked for her personally, instead of solving everything in one fell swoop (as Robin’s expecting). That’s a realistic, genuine way to bring the Mother into the fold, and instead of seeming like a savior, she instead is a friend. Just from those 30 seconds, we can ascertain that she’s supportive, compassionate, and understanding, and she would fit in perfectly with the group. However, like I said after “How Your Mother Met Me”, I just wish the writers didn’t wait so long to give us scenes like this, and short ones at that. 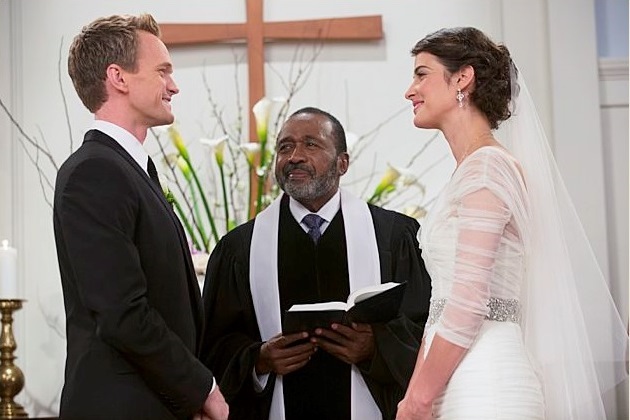 Nevertheless, the moment is great, and the episode in general is chock full of feel-good moments, from Lily and Marshall reciting new vows to the wedding itself. It has its fair share of sentiment, but the show’s earned it. I realize the episode is far from perfect, but what this episode is is a celebration of these characters we’ve known for so long. I bid adieu to you, How I Met Your Mother, and raise my glass. Bring on the series finale. -“Sandcastles in the Sand” during the ceremony. How appropriate. -Why didn’t we get to see a gorilla? -I must say, I teared up a bit during this episode. And I don’t think it was because I was stressed vowt. -The last slap is pretty satisfying. -I honestly didn’t realize Barney’s initials were “BS”. -I really wish we could’ve heard Robin’s vows. -Nice seeing a bunch of old faces in the audience. -Finale predictions, guys? Again, if the Mother dies, I will destroy everything in sight. If they really want to mess with us, they should throw in a cheesy shot of her floating away from her grave.